Hello! My name is Yvonne Schunk. In 1989, I married my best friend Jim, whom I met at Agricultural College in 1986. 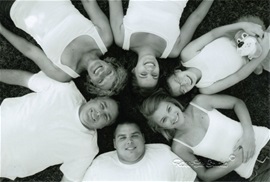 We have 4 children, Anthony James (1990), Jordan Annette (1992), Lauren Elizabeth (1994), and Erin Dianna (1998). We farm and live in Southwestern Ontario, Canada. This blog is all about Erin. When Erin was 7 years old we received a diagnosis of Baraitser Winter Syndrome. This is a very rare syndrome, and as I write this blog there are 20 confirmed cases in the world. Basically, while I was pregnant, her brain did not form properly. This malformation causes hard to control seizures, and global delays. The clinical description is as follows: Baraitser Winter Syndrome is a rare autosomal recessive disorder characterized by developmental delay, dysmorphic features, and multiple malformations also involving the brain. Ptosis (droopy eye lids), coloboma, small stature and head size, hard to contol seizures, and gradual hearing loss. Erin turned 14 this summer, and for all of the past 7 years since her diagnosis, I have been searching the web for any information on this syndrome. Because it is so rare, there is very little information, and what I do find is repeatative, and doesn't help. So, thanks to the gentle nudge from a dear friend, I am writing this blog so that other people can learn about this syndrome, and maybe other parents and loved ones of children affected will have a place to go and not feel so alone.